​to be, believe and belong. Whether you have been attending the Episcopal Church your entire life or are brand new to the faith, we meet you where you are, welcome! Our Sunday services are a way to deepen our relationship with God, ourselves and with each other. We are a friendly and welcoming congregation with a strong sense of community... come and see for yourself what makes Apostles a truly a special place you won't forget! All are welcome, without exception! In the Early Church there was a liturgical tradition (the way the people came together to pray and remember Jesus’ last supper) before there was a creed or even an agreed upon set of books considered to be authoritative scripture (what eventually developed as the Christian Testament). Finding our roots in the Early Church we Episcopalians look to the way we worship or pray to articulate our understanding of God. We understand all of creation to be sacred, meaning, all things when holy considered, point to the Presence of God with us. We are Protestant and Catholic, ancient and reformed, liberal and conservative. Another way to say this is, we walk the “via media,” the middle way that originates in ancient Greek philosophy and advocates moderation in thought and action. Historically there are three basic foundations of faith in the Episcopal Church; Scripture, Tradition and Reason. We understand Scripture to be written, rewritten, and redacted by people inspired by God’s Spirit. The Hebrew and Christian Testaments reveal the presence and action of God in history as well as tell the stories of humanity’s response to God. We understand the Scriptures to be the living, not the literal, word of God, because God, through the Spirit, continues to engage us through the wisdom rooted in Biblical literature. Tradition is expressed in our Prayers, Worship and Sacraments as handed on to us from early Christians. Tradition preserves the hymns, prayers and rituals that keep our faith alive and embody our response to God in praise, reverence and thanksgiving. Continuing historical traditions promotes consistency and transmission of the essential truths to which our liturgies (prayers and sacraments) point. Reason is our God given gift given to help us examine and apprehend God’s presence and action in scripture, our lives and the world. Rather than interpret scripture for the people, members of TEC are encouraged to use reason to make moral and ethical decisions and act responsibly in the world. We humbly acknowledge that no one can fully discern the mind and the will of God, which means, we have more questions than we have answers. Recently theologians have added a fourth dimension to understanding our faith, Experience. 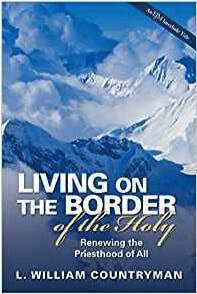 Countryman invites us to “Live on the border of the Holy” by experiencing “what is” and, understanding how (our) “experience of it is experience of the Holy.” (p19) Experience is foundational to our human condition and to our apprehension of God. We live and breathe and experience our being in relationship with God vis á vis our relationships with one another in the context of whatever is happening in our particular lives. The Holy is what is, it is our “in the moment” experience. So to Scripture, Tradition and Reason we add Experience among the ways we know God. Aligning with the Catholic dimension of our Anglican identity, Episcopalians value the sacraments as a means of God given grace expressed in our liturgies. We understand sacraments to be outward and visible signs of inward and spiritual grace. Sacraments include both a liturgical action and a material object, for example, in our Eucharistic Celebration the material objects of bread and wine are consecrated (made holy) with the words of institution said by the priest as well as the presence and affirming AMEN spoken by the congregation. Leaning toward our identity with Reformation Christianity we recognize two sacraments that were instituted by Jesus as represented in the gospels; Baptism and Holy Eucharist. The sacraments are distinguished from five additional sacramental rites; Confirmation, Ordination, Rite of Reconciliation, Holy Matrimony and Anointing of the Sick. Baptism is the public affirmation of a person’s membership in the family of God. Water is poured upon the person to wash away all that would turn them away from God. It is understood that when the newly baptized rises up from the water they are rising into new “with God” life. They are then marked as members of God’s family forever by the imposition of chrism on their foreheads in the name of One God in Trinity. For infant Baptism parents and godparents vow to raise the child in the Christian faith and life while the assembled community vows to assist them in so doing. Adults vow their intention to do likewise on their own behalf. Holy Eucharist (also called The Great Thanksgiving) was instituted by Jesus during his final passover meal with his friends before he died. During the Eucharistic Celebration we offer “our selves, our souls and our bodies to be a reasonable, holy and living sacrifice to God.” This prepares us to receive the sacramental conveyance of the risen Christ’s presence with us through the bread and wine made holy. 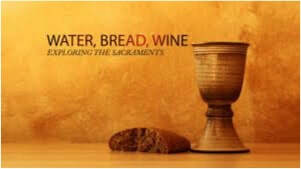 As mentioned above, the material objects of bread and wine are consecrated (made holy) with the words of institution said by the priest as well as the presence and affirming AMEN spoken by the congregation. It is customary to say “Amen” when receiving the bread and wine. This is your bold affirmation that indeed it is so, the presence of the Spirit of God is with you. AMEN. We provide a fun and safe place for your children to learn about God's love, Bible stories and caring for one another. Children come to the sanctuary to fully participate in The Great Thanksgiving. The third Sunday of every month is Children's Sunday during which they help passing the alms basin and assist at the altar. Nursery: Our two paid nursery staff offer a loving environment for infants and pre-toddlers. We believe this is an important ministry that allows parents time to worship and enjoy adult fellowship while their young children are well cared for nearby. Sunday School: Our God's Place teachers will inspire your children to learn about God as they engage the Bible stories, learn to pray, sing our service music and learn about attending “Big Church” with their parents. We pay special attention to helping children learn Mindfulness and lovingkindness by offering a 12 week Mindfulness Program twice each year. Please Note: All of our Nursery workers, Sunday School teachers, volunteers and church leaders have completed the program Safeguarding God’s Children which equips them to detect and prevent all forms of child abuse. 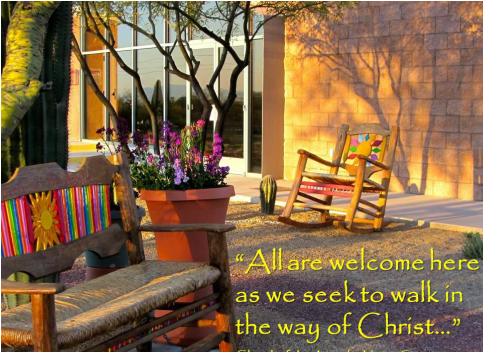 Throughout the year people walk the Way of the Cross through our beautiful desert for comfort, reflection or fun. It is also an important part of our Good Friday Service. 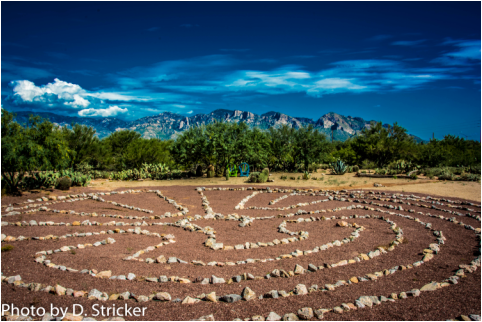 The Apostles’ Labyrinth was designed by Native Americans & built by Apostles’ members in our natural desert setting. The labyrinth is a path of prayer for all people seeking the divine, regardless of the tradition in which one stands. The labyrinth has only one path so there are no tricks to it and no dead ends. ​Walking the path with an open mind and an open heart touches our sorrows and releases our joys. We invite you to walk our amazing labyrinth!